In the field it sometimes is not easy at all to distinguish real mines from other damage to the leaves. The variation in these ‘pseudomines’ is endless, but two types can fairly easily be singled out. 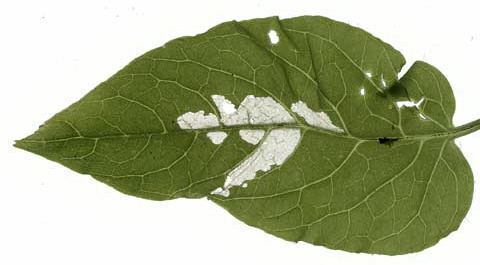 Window feeding means that a larva has been eating away all leaf tissue at one side of the leaf (generally the lower), leaving only the epidermis of the other side. The result may strongly resemble a mine. It isn’t a mine, though, because the larva is, or was, feeding freely on the leaf. Often the loupe is needed to ascertain that grains of frass that may be visible are free at one side, not fixed between two layers of epidermis. Window feeding is more transparant than the clearest full depth mine, and mostly more irregular in shape. On the border leaf-“mine” a height difference is visible, a miniature bank, as high as the leaf is thick. Cionus olens is an exceptional case. 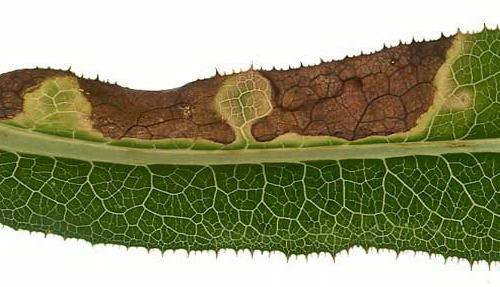 The larva causes window feeding, but the host plant has its leaved covered by a thick later of felt, which remains intact, fully isolating the larve from the world outside. Leaf spots are caused by parasitic fungi. In the spot itself the leaf tissue has died already; here the fungus develops and may produce its spores. Around the spot the leaf tissue is not yet dead, but it is already necrotic due to fungal toxins that diffuse out from the spot. The necrotic tissue takes different shades of yellow, orange, or red. Such autumn colours are never found bordering a real mine: the mining larva eats healthy plant tissue.